The dummies must know what is RPA process. The dummies means whoever new to the automation process. The point is with the software you can deliver more to the client. This is called automation. Doing more with software is the essence of digital transformation. An important part of this transformation is automating business processes, using software rather than people wherever possible. Robotic process automation (RPA) is an increasingly popular approach to doing this. Even in our digital era, many business processes are still carried out by people. Yet these processes commonly rely on one or more applications, with human beings providing the driving intelligence. think about a back office that handles customer orders. Each order might require getting a customer’s name, then looking up and validating the customer’s shipping address. Once this information is available, the next steps might be to calculate the shipping cost and place the order. In a typical back office environment, people execute this process, often relying on multiple applications to complete it. The RPA means using software rather than people to carry out business processes that rely on applications. In Simple terms, A software Robot, can able to interact with multiple applications and get the required data. This can be avoided creating multiple interfaces for each application. The good books on RPA you can read here. How robots take workload. This is how I understand, when you are dealing with people, you no need to lay off the people when you have less work. For the right kinds of processes, the economics of a robotic workforce are appealing. In fact, RPA can sometimes bring enormous benefits, especially for large enterprises. Think about it: Software robots can work every day around the clock, and they aren’t tempted to take shortcuts. If your workload increases, you don’t have to hire, train, and deploy new people; you just run more robots. If your workload decreases, you don’t need to lay anybody off; you just shut down some robots. It needs less technical knowledge and can be done faster. you can automate more business processes for less money. Software robots run the business process instead of human beings. For example, think about automating a business process that spans a range of different applications from different eras, including recently built web apps, client/server software, and 25-year-old mainframe software. If the goal is to create an automated process that handles tens of thousands of transactions a day, if the process doesn’t change often, if all of these applications expose the right APIs, and if the time and money are available, API-based process automation is probably the best choice. But if the automated process is needed quickly at lower cost, if it might change frequently, if it need handle only a few thousand transactions a day, or if the right APIs aren’t available, using RPA is probably a better approach. 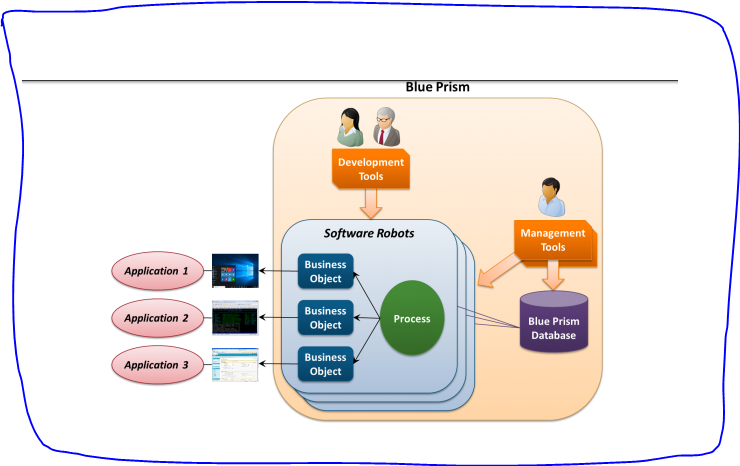 How Blue Prism tool helps to develop RPA process. Each software robot has two main parts: one or more business objects that interact with the user interfaces of the applications this robot uses, and a process containing the logic that drives the robot. Blue Prism has built-in support for connecting business objects to various kinds of application user interfaces,including browser-based HTML interfaces, Windows interfaces, mainframe applications accessed via terminals, and interfaces built using Java. Each business object implements a particular set of actions against an application’s user interface. For example, a single business object might be capable of logging in to an application, entering a customer name into a particular screen, retrieving a result, then logging off. A developer or business analyst uses a Blue Prism development tool called Object Studio to create these objects graphically—writing code isn’t required. The creator of this robot also uses another Blue Prism development tool, Process Studio, to graphically define the steps in the robot’s process. Each step in a process invokes actions in business objects to interact with an application, and once again, writing code isn’t required. 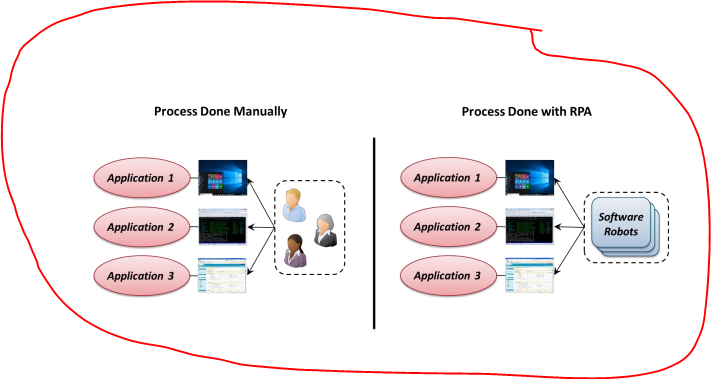 In a very real sense, a process acts like a human user accessing each application to carry out the business process. To store business objects, processes, and other information, the product provides the SQL Server-based Blue Prism database. IT and business people can use Blue Prism’s management tools to schedule when robots run, view information about running robots, and more. These tools also allow configuring users, viewing audit logs, and performing other management tasks. And to make life simpler for the people using the product, all of Blue Prism’s client tools are provided as tabs in a single application called the Interactive Client (IC).